Lost went backwards again as opposed to a flash forward, providing more on Locke’s life. I suspect we will not see a flash forward on Locke as the fate of those who do not leave the island will remain a mystery for a while longer. We find that Richard Alpert has been watching Locke since he was a born, and seems to have never aged. Matthew Abaddon met Locke when he was in physical therapy and, posing as an orderly, gave Locke the idea of going on a walkabout in Australia. This still leaves the question of how they got Locke, and the other passengers of interest, to go at precisely the time that Desmond would inadvertently cause the plane to crash. The time differences were demonstrated again as the doctor on the freighter, who has already washed up on the beach, had not yet been killed. There are also strange things going on beyond the time issue. Ben found Jacob’s cabin, only to find both Christian Shephard and Claire there. Does this mean that Claire is dead like Christian Shephard (father to both Jack and Claire) or less likely that Christian Shephard is not dead? Lindelof declined to say whether the flash forwards will continue, but did leave open the possibility of the show’s main story line on the island catching up with the flash forwards that have taken place on the mainland this season. While some ambiguity about the future of the characters is to be expected, Lost better not go out with everything left a total mystery. Fading to black won’t work as well with a show of this type as with The Sopranos. 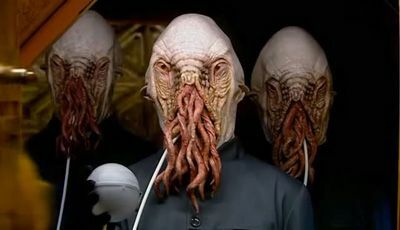 For those who watch on the SciFi Channel, Doctor Who has just revealed the back story on the Ood. There is yet another reference to a missing planet, which many speculate is a consequence of Rose jumping between dimensions. Once again The Doctor is portrayed as a heroic character who will be remembered, making the stories this season different from most in the past. The SciFi Channel remains three episodes behind the BBC. I’ll avoid real spoilers, but this paragraph will give away a little of what comes next. First there is a two parter in which Martha Jones, now working with UNIT, brings The Doctor back to earth to fight an enemy from the original series, the Sontarans. The previews for the episode which aired yesterday reveal a real shocker: The Doctor’s Daughter. The daughter (picture above) is played by Georgia Moffett, daughter of previous Doctor Who star Peter Davison. Davison, the fifth Doctor also appeared in a brief video with the current Doctor, David Tennant in a video I previously posted here. Moffett has also been cast to play Jenna Stannis in the planned reboot of Blake’s 7. Battlestar Galactica featured a guest appearance by Nana Visitor of Star Trek: Deep Space Nine. There’s also a predictable killing of a red shirt and further movement towards humans and one faction of Cylons working together. Visitor is far from the only character in one science fiction show to appear on another. This week we also learned that Bruce Boxleitner of Babylon 5 will be appearing on Heroes next season. The New York Post reveals the changes to take place on the next season of Weeds. Little Boxes will be played one final time in the first episode but now that Agrestic was burnt down the show will be moving to a seedy seaside town by the Mexican border (actually shot in Manhattan Beach, California). Nancy (Mary Louise Parker) has progressed from a suburban house wife who started selling marijuana to get by following the death of her husband to a big time drug dealer. There are three major ongoing mysteries on television: the meaning of Lost, the fate of the humans and Cylons on Battlestar Galactica (including the final unrevealed Cylon), and the identity of Ted Mosby’s future wife on How I Met Your Mother. One blogger believes he found a clue in the pictures above. The letter in Stella’s (Sarah Chalke) apartment (right) appears to be the same letter in the background behind the kids (left). This is far from conclusive. Possibly the props department just happened to use the same prop in both scenes. If Ted is really telling his children the same stories he is telling us, the kids would already know that this is their mother once he began talking about Stella by name. As with Lost and Battlestar Galactica we will have to wait and see how the mystery turns out. Posted in Science Fiction, Television. Tags: Babylon 5, Battlestar Galactica, David Tennant, Doctor Who, Heroes, How I Met Your Mother, Lost, Marijuana, Martha Jones, Peter Davison, Science Fiction, Star Trek, The Doctor's Daughter. RSS feed for comments on this post.. TrackBack URL.